There is a common phenomenon that people are always able to distinguish different types of interfaces easily after corresponding to the given pictures, but when we choose the fiber patch cable, such as the polishing type also confused them, it shows UPC or APC, also confused us, recently I finally understand it and share my ideas with you. Only from the words we can have a simple understanding of them, in order to have a deeper understanding, there i named a few examples for you. Usually when we hear about the description like “fiber patch lc apc lc upc”, “e2000 fc apc”, “sc apc to sc upc single mode 9 125 simplex fiber optic patch cord cable”, what do this words apc upc mean? Then we will give you explanations. In Fiberstore, We use different color to distinguish them, the blue is UPC connector and the green is APC connector, shown as the figure. In fact, it stands for the polish style of fiber optic core and connect the copper connector of copper cable as medium, and we need to know that the connections between the fiber optic connector and the ceramic core. Different fiber optic connector ring’s size, length and polished style is different, different polish of the fiber optic connector rings result in different performance, mainly on the back reflection. Generally, UPC is 50dB or higher and APC is 60dB or higher. 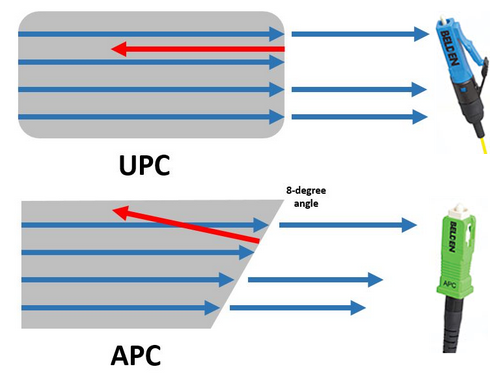 All insertion loss of that they should be less than 0.3dB and the lower insertion loss is, the better performance they have, it is the reason why UPC connector is more widespread than APC. At the same time, there is a point we need to pay attention to, we all know that fiber optic cables can be divided into single mode and multimode fiber cables, but single mode fiber optic cables can be with UPC or APC polished connectors, while multimode fibers are not made with APC connectors. When we talk about the insertion loss, fiber optic attenuators have to be mentioned, it also has the diffent db to choose, as for the more knowledge about it, please always pay close attention to. Fiberstore, you know, it offers kinds of fiber cables to choose, the different connector series all available for UPC/APC version, and we can also provide SM, MM, OM3 cables, simplex and duplex option, 0.9mm, 2.0 mm, 3.0mm cable diameter for choose, as for the fiber length, it can be customized according to your requirements. This entry was posted in Fiber Patch Cord and tagged APC, APC connector, fiber optic connector, fiber optic patch cord cable, fiber patch cable, OM3 cables, UPC, UPC connector on January 9, 2015 by Amelia.Liu. We can use magnifier to check the fiber optic connector pin end, which quickly determined that the connector insertion loss is high or low, the need for re-grinding. With this method, you only need a few seconds, you can initially conclude that the connector meets the quality requirements. Than the use of instruments that measure the specific optical connector insertion loss value, and then determine wheter the quality meets the requirements, greatly reducing the time and improve efficiency. This entry was posted in Bulk Fiber Cables and tagged dust cap, fiber adapters, fiber optic connector on July 16, 2013 by Amelia.Liu. A fiber optic connector terminates the end of an optical fiber and enables quicker connection and disconnection than splicing. The fibers are mechanically coupled and aligned to ensure that light can pass. There has been many different connectors introduced through the development of fiber optic components previously many years. A lot of companies and individuals happen to be trying to improve the options that come with certain connectors to be able to gain control of the fiber optic industry, but only few have been successful. 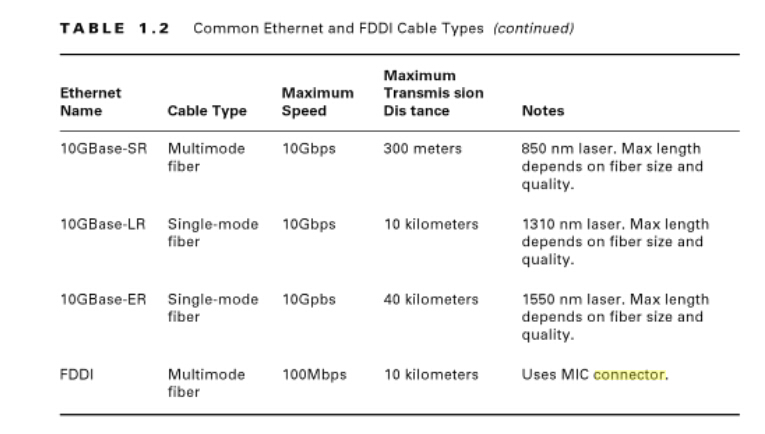 As technology increases, various fiber optic components have become less expensive. There are various color codes for connectors and they have changed throughout the years. In early stages of fiber optic history, orange, black or grey represented multimode connectors and yellow represented single mode. These original codes became complicated with the introduction of metallic connectors so colored boots were developed, like FC and ST. Now, beige boots stand for multimode, blue means single mode and APC or angled connectors are represented by green boots. The LC connector is a universal connector. It is available in simplex and duplex configurations and is half how big the SC and utilizes a 1.25mm ferule. The LC is highly favored for single mode and is easily terminated with an adhesive. They’re actively replacing the SC connectors in corporate environments due to their smaller size. Built on style with LC, LC attenuators really are a combination of a connector on a definite end, as well as an adapter on the other. This enables so that it is “plugged-in” to just about any LC adapter. The assembly contains a ferrule that’s accessible in standard Polish connectors (PC) and 8 degree angle Polish (APC). They’re backward suitable for existing transmission equipment, while the APC attenuators provide superior reflection required for high power and analog equipment. LC fiber optic attenuators are designed to provide horizontal spectral attenuation over the full spectrum vary from 1280nm to 1624nm. This way the LC attenuators expand the capability of optical networks by enabling using the E-band (1400-nm window) for optical transmission. LC fiber optic attenuator is a passive device accustomed to reduce light signal intensity without significantly changing the waveform itself. It provides a type of metal-ion doped fiber which reduces the noiseless signal because it passes through. This process of attenuation allows for higher performance than fiber splices or fiber offsets or fiber clearance, which function by misdirecting rather than absorbing the joyful signal. This is often a requirement in Dense Wave Division Multiplexing (DWDM) and Erbium Doped Fiber Amplifier (EDFA) applications in which the receiver can’t accept the signal produced by a high-power light source. LC fiber optic attenuators are key in controlling manipulating the electricity of an optical path in fiber optic telecommunication systems. LC Build-on fiber optic attenuators are used to reduce excess optical power from the transmitter that can result in over-saturation of the receiver. These optical attenuators feature simple and rugged structure utilizing ion doped fiber because the attenuating material. They can be placed directly on the active equipment and therefore are able to withstand over 1W of extraordinary power light exposure for longer periods of time, which makes them well-suited to EDFA and other high-power applications. This entry was posted in Optical Attenuators and tagged fiber optic connector, LC connector, optical attenuators on June 21, 2013 by Amelia.Liu.